How Would My Child Develop Amblyopia? Is Amblyopia often tied to genetics? Yes, amblyopia is often tied to genetics. This means that if a member of your family has been diagnosed with amblyopia, your child is more likely to have it as well. If your child was born prematurely or has other developmental issues, this can also contribute to the development of amblyopia. In strabismus, one of your child's eyes may look straight while the other may look inward, outward, up or down. This happens as a result of weakness or underdevelopment of the muscles in charge of eye movement. This misalignment of the eyes causes difficulty with binocular fusion. This is the ability of your child's brain to interpret the two distinct, but similar, images sent to it from both eyes into a unified picture. If this condition goes untreated, amblyopia is likely to result, since the brain is then forced to deal with this difficulty by ignoring the signals coming from the misaligned eye, causing it to become amblyopic. Amblyopia can also result from different visual strengths in each eye. This condition is known as anisometropia. If this condition goes untreated for too long, your child's brain will learn to favor the eye that provides clearer vision, and ignore the signals it receives from the weaker eye, making it amblyopic. How Will I Know If My Child Has Amblyopia? 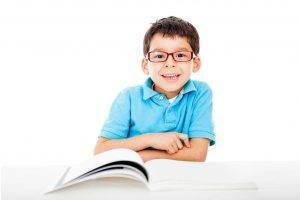 In many cases, it is not the child that notices that he or she has vision issues. Children are extremely good at adapting to overcome difficulties, and your child is likely to come up with ways to compensate without realizing that his or her sight is flawed. It is, therefore, up to parents, teachers and family doctors to notice the signs and symptoms and act accordingly. If you notice your child has crossed eyes, squints often in order to see or tilts his or her head to see better, you should consult an eye doctor to check for amblyopia. Your child may also display poor depth perception or an inability to see in three dimensions as a result of the brain effectively seeing out of only one eye. Is Amblyopia Treated In Your Hemlock & Saginaw Eye Clinics? Yes. For more information about your child's amblyopia, contact our eye doctors today.